Added to concrete and mortar mixes to form a permanent waterproof lining. Used on concrete, render, above and below ground level, such as basements, tanks, lift wells, tunnels and planter boxes. 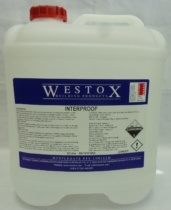 One Litre Interproof to 30 Litres of water. Use three parts plastering sand / one part cement and mix.